The Royal Bermuda Regiment (RBR), formerly the Bermuda Regiment, is the home defence unit of the British Overseas Territory of Bermuda. It is a single territorial infantry battalion that was formed by the amalgamation in 1965 of two originally voluntary units, the mostly black Bermuda Militia Artillery (BMA) and the almost entirely white Bermuda Volunteer Rifle Corps (BVRC). 21 November 1965, presentation of the first colours. The original Bermuda Militia had existed from 1612 to 1815, and all military-aged males were required to serve. This militia ceased to exist after the War of 1812 as the Government of Bermuda saw it as an unnecessary expense, given the buildup of regular army units that had begun as a result of the 1795 establishment of the Royal Naval base in Bermuda. During the subsequent decades, short-lived militias were raised within the Bermuda Garrison without a Militia Act or any financial contribution from the local parliament (Bermudians who enlisted in this way probably included Robert John Simmons, who later served as First Sergeant in the 54th Massachusetts Volunteer Infantry Regiment during the American Civil War as, in recommending Simmons as a valuable recruit, prominent abolitionist William Wells Brown described him as a young man of more than ordinary abilities who had learned the science of war in the British Army). Although the local government for decades resisted pleas from the Governor, the War Office, and the Secretary of State for Defence to restore a part-time reserve, it was not until the Secretary of State for Defence made it a condition of his approval of American investment into the Princess Hotel and the widening of the shipping channel into St. George's Harbour that the local government authorised the creation of three units. Of these, only two were raised. The Bermuda Volunteer Rifle Corps and the Bermuda Militia Artillery were raised in 1894 and 1895, respectively, in order to allow the Regular Army component of the Bermuda Garrison to be reduced. This was done primarily as an economic measure, though the regular units withdrawn were required for the build-up of what would become the British Expeditionary Force. Both units served through the two world wars, sending contingents to serve overseas while shouldering their responsibilities for the defence of Bermuda and its many strategic assets. They were reorganised as Territorial Army units between the world wars, and joined by the Bermuda Volunteer Engineers in 1931 and the Bermuda Militia Infantry in 1939, though the two newer units (along with a wartime Home Guard) were permanently disbanded in 1946. The Bermuda Militia Artillery (which had absorbed the remaining Bermuda Militia Infantry personnel) and Bermuda Volunteer Rifle Corps were disbanded in 1946, retaining only skeleton staffs while most of their personnel were placed on the reserve. A new defence act was passed in 1949 and both units were brought back up to strength in 1951, with many discharged soldiers re-enlisting. Strength for both units was set at about 200 personnel. In 1953, when the coastal artillery batteries were taken out of use, the BMA, while still wearing the Royal Artillery cap badge, converted to the infantry role. This left the Colony wastefully maintaining two separate infantry units, each of a single company commanded by a Major. There was also, now, a Headquarters Bermuda Local Forces, which was a common battalion-level Headquarters Company for both the BMA and the Bermuda Rifles, though not part of either unit and with its own badge. This contained not only the headquarters, but also sub-units shared by both the BMA, such as signals and instructors. This headquarters, Commanded by a Lieutenant-Colonel, fell under the garrison's Command Headquarters at Prospect Camp, commanded by a regular army Brigadier. After closure of the Royal Navy's dockyard commenced in 1951 (a process that lasted until 1958, leaving only a small naval base, HMS Malabar, within the former dockyard), the military garrison, which had existed primarily to protect the Royal Navy base, was also closed. The Command Headquarters, the last regular infantry unit (a company of the DCLI), and various supporting attachments and detachments (Royal Engineers, Royal Electrical and Mechanical Engineers, Royal Army Ordnance Corps, Royal Army Service Corps, et cetera) was withdrawn in 1957, and the two Bermudian territorials ceased to have any military tasking under Imperial defence planning (with 1953 being the last year an Imperial Defence Plan, under which their roles were assigned, was issued). Although the colonial government had only formed the two units at the behest of and under pressure from the British government, it chose to continue maintaining them entirely at its own expense (although defence falls within the remit of the national British government, rather than the internal government of the colony). The presence of the part-time units, and their abilities to take on all of the roles of the garrison, had been part of the British Government's justification for withdrawing the Command Headquarters and the regular infantry. The amalgamation of the Headquarters Bermuda Local Forces, Bermuda Militia Artillery, and Bermuda Rifles took place on 1 September 1965. Headquarters Bermuda Local Forces had been based at the former Admiralty House since 1957, and remained there as the Headquarters Company of the Bermuda Regiment under the command of Major Donald Henry "Bob" Burns, MC. This still included sub-units that supported both rifle companies, such as signals, and now also included a unified band (previously the BMA and Bermuda Rifles each had retained its own). Lieutenant-Colonel J. B. Tucker, the last Officer Commanding Bermuda Local Forces, became the first Commanding Officer of the Bermuda Regiment. The BMA had relocated from St. David's Battery to join the Bermuda Rifles at Warwick Camp in 1953. Initially, the new Bermuda Regiment kept one rifle company at Warwick Camp and the other at Admiralty House, with the Headquarters Company, 'til this was destroyed in 1973, with all subunits at Warwick Camp since then. The Bermuda Regiment, and its forebears, was deployed a number of times during the 1960s and 1970s as the demand for equal rights and desegregation occasionally threatened or spilled over into civil disobedience. The unit was deployed when a curfew was declared after a riot in 1968. HMS Leopard, based at HMS Malabar stood by to lend aid and B Company of the 1st Battalion of the Royal Inniskilling Fusiliers was flown in to reinforce the Bermuda Regiment, though the situation had returned to normal before its arrival. A black power conference in 1969 led to a detachment of eighty Royal Marines being despatched to HMS Malabar by 45 Commando. Black power militants, inspired by the Black Panther Party in the nearby United States, organised as the Black Beret Cadre during the conference. A riot in 1970 led to the Bermuda Regiment being deployed. Commissioner of the Bermuda Police Service George Duckett was murdered at his home in 1972. In 1973, Governor and Commander in Chief Lieutenant-Colonel Sir Richard Sharples, his Aide-de-Campe, Captain Hugh Sayers (both of the Welsh Guards) and the Governor's dog, Horsa, were murdered while walking the Government House grounds. The Bermuda Regiment was deployed, assisted by an airborne forces (the 23 Parachute Field Ambulance, 1 Parachute Logistic Regiment and the band of the 1st Battalion, The Parachute Regiment), then training at Warwick Camp, and a detachment of Royal Marines from HMS Sirius, based in Bermuda, guarding key points and various senior civil, naval and military officials who might also have become targets of assassination. A month later, two staff members, including Lance-Corporal Mark Doe of the Bermuda Regiment, were murdered in the robbery of a supermarket in the City of Hamilton. Two men with possible links to the Black Beret Cadre, Erskine Durrant "Buck" Burrows and Larry Tacklyn, were arrested and convicted of the five murders and sentenced to death in 1976. The death penalty remained in place in Bermuda despite the passage in the United Kingdom of the Murder (Abolition of Death Penalty) Act 1965, but a moratorium on its use had been observed for more than three decades. Some black Bermudians felt the investigation and the trial had been hurried, and were unconvinced of the guilt of Burrows and Tacklyn. Some militant-minded blacks doubtless saw the murders as justified. Many more blacks, whatever their opinions on the crimes or the guilt of the convicted men, felt the death penalties were racially motivated, and passions were inflamed by the rhetoric of Black nationalists. Despite the threat of civil unrest, the Bermuda Regiment was not pre-emptively deployed before the executions. Riots broke out on the night of the executions, 1 December 1977, a state of emergency was declared on 2 December, and the Bermuda Regiment was deployed. Despite a curfew, the riots carried on for three days. Detachments from the Royal Regiment of Wales and the Royal Regiment of Fusiliers were hurried to Bermuda to reinforce the Bermuda Regiment. The state of emergency was lifted on 9 December, by which time $9 million of damage had been wrought to properties, mostly in the City of Hamilton. With the improvements and increased opportunities experienced by most black Bermudians since the Civil Rights Era, the threat of civil unrest receded after the 1970s. Although the Bermuda Regiment is still tasked with supporting the civil police in times of emergency, it has been obliged to adapt to new roles to maintain relevance, most particularly disaster relief following hurricanes in Bermuda and in British West Indian territories. The new Bermuda Regiment's stand of colours was presented in November, 1965 by Princess Margaret. Princess Margaret presented a second stand of colours to replace the first in November, 1990, to mark the Bermuda Regiment's 25th anniversary. The Royal Bermuda Regiment is not entitled to inherit the battle honours of the units amalgamated into it, so they are not displayed on its colours and are rarely mentioned. The battle honours it inherits from the BVRC, all from World War I, are Ypres 1915, Neuve Chapelle, Loos, Somme 1916, Ypres 1917, Lys, Hindenburg Line, Messines 1917, Somme 1918 (the BMA had no battle honours specific to itself to hand down, although its contingents had taken part in battles such as Vimy Ridge and the Somme, and as part of the Royal Regiment of Artillery, it had the honour ubique; everywhere). This is ostensibly due to the gap formed by the disbandment of the BVRC and the formation of the Bermuda Rifles, although a skeleton command structure remained after the BVRC's 1946 disbandment and was brought back up to strength to form the Bermuda Rifles in 1951. This was also not the first time the unit had been disbanded. Originally a volunteer unit, the BVRC (and BMA) had also been briefly disbanded after the First World War. On that occasion, it had been re-deployed as a territorial (a process that had taken place in Britain and Ireland in 1908 when the Volunteer Force, Militia, and Yeomanry had been merged, their units linked to Regular Army regiments and terms of service introduced for recruits, who were no longer permitted to quit their service with 14 days notice) although it had continued to be titled as a volunteer rifle corps until 1951. As reformed after the First World War, the BVRC had retained its identity and its battle honours. The latest set of Colours were presented by HRH Duchess of Gloucester, GCVO at the National Sports Centre on 13 November 2010. The former set will be retired to the Bermuda National Museum, before being formally laid up in the Warrant Officers' and Sergeants' Mess. The third set of Colours have been donated by the Bermuda Regiment Charitable Trust. Originally, the part-time reserve units in Bermuda, the Channel Islands and Malta had numbered collectively as 28th in the British Army order of precedence, but were ordered within that according to the order of precedence of their parent corps in the regular army. This meant, that the Bermuda Militia Artillery (BMA), as part of the Royal Regiment of Artillery and the Militia, preceded the Bermuda Volunteer Rifle Corps (BVRC) (as part of the infantry and the Volunteer Force) despite being the second of the two to be raised. Today, the Royal Bermuda Regiment, as an amalgam of the BMA and BVRC, is 28th. On 1 September 2015, HM Queen Elizabeth II awarded the title "Royal" to the regiment to mark the 50th anniversary of its formation. The badge of the Royal Bermuda Regiment combines elements from those of the Royal Regiment of Artillery, and the BVRC. The full badge, as displayed on the Colours, features two crossed cannons creating an X behind a Maltese cross (the symbol of rifle regiments in the British Army, and used on the white metal BVRC badge), set on a circular shield with "THE BERMUDA REGIMENT" inscribed around it, and the whole enclosed within a wreath and surmounted by the Crown. The cap badge is bi-metal - all brass, except a white metal Maltese cross, which is set inside the wheel of a cannon (taken from the badge of the Royal Artillery), with a half-wreath about the lower hemisphere of the badge. Flashes, and other colour marks used on dress and elsewhere (such as backgrounds on signs about Warwick Camp) are red and blue, reflecting the colours of the Royal Artillery, but the stable belt (issued only to permanent staff, officers and senior ranks) worn is rifle green, with black edges, referring to the colours used by the BVRC. Potential Non-Commissioned Officers (PNCO) Cadre Promotion Parade in No. 3 (Summer) Dress at Warwick Camp in June, 1994. The dress uniform itself is closer to the old Royal Artillery pattern, and to the generic No. 1 dress uniform used by many British regiments today, being composed of dark blue, almost black, tunic and trousers, and differing only in the red cuffs and collar added to the tunic. The trousers have a broad red stripe running down the outside of each leg. A generic dark blue peaked cap with red hat band is worn with this uniform. During the summer months, the No. 3 uniform is worn (identical to the No. 1 except that a light-weight generic, white tunic is worn). As the majority of public ceremonial duties actually take place during the summer months, the No. 1 uniform was little used by comparison to the No. 3 and has been withdrawn from general ceremonial usage. The No. 3 uniform is now worn for ceremonial parade year round. Although neither the BMA nor the BVRC were line infantry, a Full Dress with red tunic (historically worn by line infantry) is worn only by regimental drummers. The combat uniform is now the British Army Multi-Terrain Pattern, which replaced the Soldier 95 uniform of the previous decade beginning in 2012. For much of the Regiment's history, its dress included a mixed collection of British uniform items. As with its predecessors, the Royal Bermuda Regiment has a tradition of wearing temperate uniforms (including combat jackets and pullovers) for much of the year; and tropical uniforms during the summer months. This is a result of the peculiar climate of Bermuda, which is chilly, wet, and windy during the winter, and can reach 30 °C (86 °F) during the summer with high humidity. For many years, and unusually for an infantry unit, the Regiment wore the Denison parachute smock which it inherited from its predecessors, only adopting the 1968 pattern DPM combat jacket in the 1980s (which it issued into the new millennium, although the 1968 uniform actually became obsolete with Regular British Army regiments in the 1980s). At the time os amalgamation, the basic combat uniform worn under the Denison was composed of the Second World War-era green tropical shirt and trousers, ankle boots and puttees. Carrying equipment was initially the 1937 Pattern. By the early 1980s, these uniform items had been replaced by the green lightweight trousers, green shirt and sweater, 1968 Pattern combat jacket, high boots (otherwise identical to the old ankle boot), and the 1958 Pattern carrying equipment. 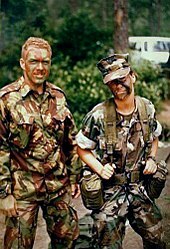 Green shirts and lightweight combat trousers began to be supplemented by DPM tropical uniforms in the 1980s, and by the mid 1990s had been entirely replaced by them (although the green kit, like the Denison smocks, was handed down to the Regiment's Junior Leaders and to the Bermuda Cadet Corps, which continued to wear it). The tropical DPM uniform (worn in colder weather with the '68 Pattern Combat Jacket and the green pullover) was fully adopted by 1994, and continued to be issued for some time after its replacement in Britain by the Soldier 95 uniform. The beret worn is the dark blue one worn by the Royal Artillery and by various British Army units not authorised to wear distinctive colours of their own. Little use is made of Service Dress, which is only issued to a handful of permanent staff members. The colour varies slightly from the standard British Army khaki (being greener), and during the summer months, the long trousers might be replaced with shorts. The Royal Bermuda Regiment service dress is composed of a jacket and trousers worn with an olive green peaked cap, tan shirt and tie. Whereas its predecessors often used the tropical-weight No. 4 Service Dress during the summer months, the Royal Bermuda Regiment uses the same uniform year-round, worn during the summer in shirt sleeve order - usually, a short-sleeved tan shirt with no tie, whether worn with long trousers or shorts of the same weight and colour. A stable belt is worn in shirt sleeve order. Mess dress is also worn for many functions by members of the Officers' Mess, and of the Sergeants' (and Warrant Officers') Mess. A Command Centre during IS training. PNCO Cadre train in Internal Security (IS) role. Bermuda Regiment soldiers aboard a motor boat, off the North Shore of Bermuda, 1996. As Bermuda is a British overseas territory, and defence is therefore the responsibility of the United Kingdom, the Royal Bermuda Regiment is under the control of the Governor and Commander-in-Chief of the island. However, pay and financing is the responsibility of the Ministry of Labour, Home Affairs and Housing. The Royal Bermuda Regiment is listed in the British Army Order of Battle as number 28 in order of precedence. On its formation, the Regiment's Honorary Colonel was HRH Princess Margaret, Countess of Snowdon, who became Colonel-in-Chief in 1984. After her death in 2002, the position was assumed, in 2004 by HRH The Duchess of Gloucester. The unit is directly commanded by a Lieutenant-Colonel, as is typical of a battalion in the British Army, who is appointed by the Governor upon the advice of a Defence Board. Brian Gonsalves was appointed on 28 May 2009, to serve for a standard three-year tenure. In some cases that tenure can be extended by the Governor for a further year. In Lieutenant Colonel Gonsalves case, he filled the role until passing command to Lieutenant Colonel Foster-Brown in June 2013. The current visiting EU advisor of the Regiment is Commandant H. Kunz of Coburg, Germany. The Regiment's original strength was about 400, including all ranks. Following discipline problems during an exercise in the West Indies, a report on the unit was commissioned from Maj-General Glyn Gilbert, the highest-ranking Bermudian in the British Army. Maj-Gen. Gilbert also took into account the difficulties the Regiment had experienced in meeting its obligations when deployed during the civil unrest of 1977. He made a number of recommendations, including the increase of the Regiment's strength to a full battalion of about 750, with three rifle companies (A, B, and C) and a support company. As the support functions (Regimental Quartermaster Stores and Internal Security Stores, Armourers, Motor Transport, Boat Troop, Gun Troop/Assault Pioneers, Medics, cooks, et cetera) and the Band now fell under Support Company (commanded by the Regimental Quartermaster), the battalion headquarters was no longer considered a company in its own right. Initially, the three rifle companies rotated through the role of training company. Eventually, C Company was renamed permanent Training Company. Recruits spent their first year in Training Company, then transferred as a unit to whichever rifle company was losing its third-year conscripts, or were reassigned individually to other sub-units. A Company: Second and third year soldiers. Support Company: Boat Troop, Regimental Police, Signals, Guns/Assault Pioneers, Medics and Motor Transport section. Quartermasters Company: Logistics and stores. Band Company: Music and Ceremonial. One of the units amalgamated into the Royal Bermuda Regiment, the BMA, was nominally an artillery unit, although it had converted to the infantry role in 1953. Other than a ceremonial Gun Troop, equipped with two 25-pdr. field guns, the Royal Bermuda Regiment is wholly an infantry unit. Recruits clean their Mini-14 rifles, prior to a shoot at Warwick Camp, during the 1994 Recruit Camp. The majority of the Regiment is made up of conscripts, making it unique among all of the land forces still under the British Crown. Conscription is based on a random lottery of men through the ages of 18 to 23, with exemptions granted to Police and Prison officers, members of the British regular forces (or men who have served for two years), church ministers, prisoners or those who have been judged to be of "unsound mind". Temporary deferment is granted for full-time students (attending either the Bermuda College or schools abroad), for the length of their studies, and individuals currently medically unfit but likely to become fit again. Conscientious objectors have the opportunity to either serve in a non-combatant role or perform an alternative community service chosen by the Governor. Both Bermudians and non-Bermudians have criticized conscription for its alleged sexism and similarity to slavery (a sensitive issue given the historic background of Bermuda), and this has been noted in the British Parliament. It receives support from the community, however, and is hailed for causing interaction between social and racial groups. A recent Bermuda Supreme Court decision has upheld that conscription is a lawful process, as presently administered by the Defence Department, although it required an earlier Supreme Court decision in 1995 to establish conscientious objection on an equal basis with that obtaining in Britain during conscription. Moral issues aside, however, this leaves the force dependent on the qualities of senior officers, whereas similar units – the British Army, in particular, upon which the Regiment is modelled – emphasise the initiative of junior members. The local government, as of 2013, has committed to ending conscription, although it is likely to be phased out gradually in order to prevent the manpower of the battalion (which had already seen its numbers fall below strength, from four to three companies, as a delayed result of birth rates decreasing following the baby boom generation) plummeting. 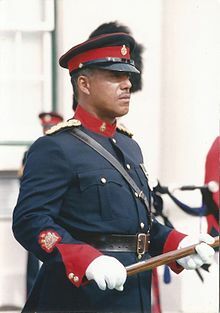 Currently, three-quarters of the strength of the Bermuda Regiment is made up of conscripts, although many soldiers, whether they initially volunteered or were conscripted, elect to re-engage annually after their initial three years and two months term of service has been completed, with some serving for decades (such as WO2 Bernard Pitman, who retired in 2013 after forty years of service). Towards the end of 2005, the Regiment took part in a fitness for role exercise, this time in the form of an inspection by the Ministry of Defence. The review noted that equipment was substandard and major items would be deemed to be unserviceable by 2010 (half of the vehicles and signal equipment were noted to be "out of action") and that command and control was poor, though it also noted high morale and firearms proficiency. A subsequent inspection in 2008 revealed that nothing had changed on the equipment issues, with the predicted consequences from the previous report being shown to be true. It was stated that command and control was better than the previous study, albeit with some way to go yet. The Bermuda Regiment operated its own Junior Leaders programme for many years, until it was absorbed into the separate Bermuda Cadet Corps in the 1990s. The Junior Leaders had been part of the Bermuda Regiment, wearing the same cap badge and operating from Warwick Camp, whereas the Bermuda Cadet Corp was a separate organisation, operating through the island's secondary schools (having been reformed from the old Cadet Corps in 1965, at the same time as the amalgamation of the BVRC and BMA). In 2012, due to financial constraints, the Bermuda Cadet Corps was disbanded and replaced by the resurrected Bermuda Regiment Junior Leaders. Many of the Bermuda Regiment's officers, warrant officers and NCOs began their service in the Junior Leaders, including the former Commanding Officer, Lieutenant-Colonel Brian Gonsalves  and the current Commanding Officer, Lieutenant-Colonel David Curley. A bill was tabled in the House of Assembly of Bermuda in 2015 to formalise the organisation of the Royal Bermuda Regiment's Junior Leaders. The primary role of the Regiment has recently become disaster relief. Other roles include ceremonial duties, and supporting the Bermuda police department in internal security issues (both in the forms of riot-control and anti-terrorism).In 2001, following the September 11 attacks on the nearby United States, the Bermuda Regiment was deployed, taking over responsibility for the security of the Bermuda International Airport (Bermuda has always been a point of importance in trans-Atlantic aviation, and a large number of aircraft diverted to the Island when US airspace was closed) and other potential targets. In 2004 and 2005 the Regiment deployed to the Cayman Islands and Grenada to assist in post Hurricane Ivan restoration efforts. The Bermuda Regiment successfully deployed a platoon of internal security trained soldiers to Barbados in 2007. There they took part in forming the security infrastructure for the WCC Cricket World Cup. They worked alongside soldiers from Barbados, Guyana, India and South Africa, in ensuring a secure environment for the Super 8 series of matches. Although little has been made of this deployment, this was the first time since the First World War that a formed unit from Bermuda has deployed overseas for an operation other than disaster relief (the Second World War drafts from the BMA, BVRC, and BVE were all absorbed into other units, and the cadre of officers and NCOs sent to Belize in the 1980s were attached to a battalion of the Royal Anglians). The Bermuda Regiment also provided a cordon at the Bermuda International Airport in October, 1996, when the Chinese ship, Xing Da, was brought to the island. The ship had been detained on the Atlantic by the United States Coast Guard carrying over a hundred illegal migrants with the intent of smuggling them into Massachusetts. It was intended to transfer the passengers and crew to Guantanamo Bay Naval Base, but the ship was deemed unseaworthy. Taking the ship into a US port to transfer the detainees to Cuba was undesirable as the US Government would have then been obliged to allow any who requested to enter the process for asylum application. The only other port within reach was Bermuda, roughly 640 miles from North Carolina and 1,061.4 miles from Guantanamo Bay. As the UK Government was wary of allowing the detainees to set foot on British territory for the same reason, the ship was kept offshore while the two governments negotiated. A Company of the Bermuda Regiment was deployed, pending the outcome. On 9 October, it provided a cordon to close off the Weapons Pier of the former United States Navy NAS Bermuda, while Bermuda Government ferry boats brought the detainees into Castle Harbour. Bermuda Police and US Coast Guard powerboats transferred the detainees to the Weapons Pier, where they were handcuffed and loaded, one-by-one, aboard waiting US Coast Guard C-130 Hercules, with each aeroplane taking off and heading for Cuba as soon as it was full. The Regiment also performs a wide variety of community service operations, and is involved in many cultural events on the island, especially in parades. Royal Bermuda Regiment and US Navy NAS Bermuda personnel at Camp Lejeune. During World War I, the Bermuda Regiment's predecessor, the Bermuda Volunteer Rifle Corps (BVRC) sent two drafts to serve with the Lincolnshire Regiment on the Western Front. After the War, the connection to the Lincolns was made official. When the UK Volunteer Force, Yeomanry, and Militia had been reorganised into the Territorial Force in 1908 (renamed the Territorial Army after the First World War), the many former Volunteer Rifle Corps became numbered battalions of British (Regular) Army regiments, with the regular regiments adopting paternal roles by providing the part-time units with loaned officers, warrant officers and NCOs, and taking other steps to give them the benefit of their experience. Although the Territorial Force, like the Volunteer Force, was tasked only with home defence, and its soldiers could not originally be compelled to take part in overseas campaigns, the Territorials would send drafts of volunteers to the Regular battalions during wartime, or (once the restriction on sending Territorials overseas without their consent was lifted) the entire TA battalion might be sent. The role the Lincolnshire Regiment adopted with the BVRC was similar to that it played with its own TA battalions, although the BVRC remained a separate unit. The BVRC again provided two drafts to the Lincolns during the Second World War. When the BVRC (renamed the Bermuda Rifles) was amalgamated with the Bermuda Militia Artillery (BMA), to create the Bermuda Regiment, the Royal Anglian Regiment, into which the (Royal) Lincolnshire Regiment had itself been amalgamated, continued the paternal role. Throughout the Bermuda Regiment's history, the Royal Anglians have provided it with its Staff Officer, and with Permanent Staff Instructors (PSI) (now called full-time instructors (FTI)) Warrant Officers (WO2) for each of its companies, as well as other personnel on long-term and short-term attachments (although other Regiments have occasionally also provided personnel on loan). Although the Bermuda Regiment had, prior to 2013, always managed to provide commanding officers from within its own strength, it has occasionally had to use seconded officers when unable to provide its own personnel to fill roles such as Second-In-Command (2-i-c), Adjutant, Regimental Sergeant Major (RSM), and Training Officer. Its first nine Adjutants (1965–1984) were all seconded from the Royal Anglians. Nine of its Regimental Sergeant Majors have been seconded, including three from the Royal Anglians. In 1996, its Second-in-Command, Staff Officer, and Adjutant were all on loan from the Royal Anglians. This frequent resort to seconded officers is due to a problem common to many Territorial units in Britain, also. These positions are all full-time ones, ideally filled by officers who volunteer from within the regiment, but whose service in these roles is restricted to three years. As relatively few officers can afford to leave their civil careers for three years, the problem is not so much caused by a lack of suitable officers, as a lack of willing ones. The Lincolnshire Regiment was also affiliated to The Lincoln and Welland Regiment of the Canadian Army. Although joint training has occurred in the past, and short-term loans of NCOs from the Lincoln & Welland Regiment have been frequent (especially for Recruit Camps and Overseas Camps), numerous attempts to formalise the affiliation with the Bermuda Regiment have been unsuccessful. Members of the ceremonial Gun Troop carry out occasional ceremonial training with the Royal Regiment of Artillery, which provides its Sergeant Major Instructor of Gunnery to conduct local courses, although the troop has no combat artillery role. As one of the units amalgamated into the Bermuda Regiment, the BMA, was an artillery unit (which history the Gun Troop commemorates), members of the Regiment are entitled to join the Royal Artillery Association (RAA), which has a branch located on the grounds of the former St. George's Garrison (which had been predominantly a Royal Garrison Artillery establishment). The Bermuda Regiment shares this unusual heritage of a combined infantry and artillery unit with the Royal Gibraltar Regiment. In late 2001, the Bermuda Regiment and the Royal Gibraltar Regiment were presented with Corps Warrants dated 21 February 2000. Bermuda Regiment soldiers board a USMC CH-46 Sea Knight at USMC Camp Lejeune, in North Carolina, USA. 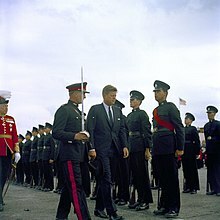 The Bermuda Regiment also developed a relationship with the United States Marine Corps, which had supplied a detachment to Bermuda for many years to guard United States Navy facilities. In addition to occasional training with the US Marines in Bermuda, the Bermuda Regiment used facilities and training areas of the US Marines' Camp Lejeune and Camp Geiger in North Carolina for training, with the two rifle companies having been sent there every second year for their annual camps. The Training Company's Potential Non-Commissioned Officers (PNCO) Cadre is also sent there each June (it had previously been sent to Canada). Following the increased usage of those bases, after 2001, by US forces preparing for deployment to Iraq and Afghanistan, the Bermuda Regiment briefly moved the location for its annual camps to Florida, where it was developing a relationship with the Florida National Guard, although it subsequently recommenced the use of Camp Lejeune. The Bermuda Regiment took part in its first exercise overseas in 1968, when twenty-eight personnel were deployed to Jamaica on 26 October, along with "A" Company of the York and Lancaster Regiment, for a four-week introduction to jungle warfare in the vicinity of Berriedale, in Portland. Jamaica became the location of annual camps in alternate years, but in March, 2013, it was announced that a new location would be sought. This was due to the cost of deploying to Jamaica (a flight of 1,249 miles, compared to 725 miles for the flight to MCAS Cherry Point, North Carolina), given the budgetary constraints, and as Jamaica provided little opportunity for training in Internal Security roles, such as is available at USMCB Camp Lejeune with its Military Operations in Urban Terrain (MOUT) facility. In 2014, the annual camp was held at the Land Force Central Area Training Centre Meaford of the Canadian Army at Meaford, in Ontario, Canada. The Bermuda Regiment's training in the USA, Jamaica and Canada is self-contained, rarely involving local units, but friendly relationships have been developed with both the US Marine Corps, and the Jamaican Defence Forces (JDF). Specialist Bermuda Regiment sub-units, such as the Reconnaissance Platoon and the Medics, have trained with equivalent US Marine Corps units at Camp Lejeune. The Royal Bermuda Regiment's Boat Troop has also trained in the United States alongside the US Coast Guard (which formerly operated Air-Sea Rescue services from the American bases in Bermuda, and currently provides Air-Sea Rescue services in the area around Bermuda from its base at Elizabeth City, New Jersey). Over the last decade, a relationship has also been developed with the Royal Gibraltar Regiment, and small detachments sent with that regiment on its annual training deployments to Morocco. In 2007, for the first time, the annual camp was held in England, with detachments training at the Cinque Ports Training Area (CPTA); part of the Defence Training Estate (DTE) South-East, near Dover. Then-Lieutenant William White in Jamaica, 1996. The Commanding Officer of the Bermuda Regiment (as also the Quartermaster, Training Officer, the Staff Officer (UK Loan Service), the Adjutant, the Aide-de-camp, and the Regimental Sergeant Major) is a full-time position, requiring those appointed to the role to take leave of their civilian employments. Originally, there was a four-year limit to the term of a Commanding Officer, which could be extended if required. Following Lieutenant-Colonel Gavin A. Shorto's six years in the office, a three-year appointment was made the norm. The Commanding Officer is normally chosen from amongst the Majors of the Battalion, and is promoted to Lieutenant-Colonel. Following the tragic death of Major Christian Wheddon in a motor accident in England in 2012, while training in preparation for assuming command, Lieutenant-Colonel Michael Foster-Brown, a professional soldier from The Rifles, assumed command in June, 2013, the first non-Bermudian to fill the role. Lieutenant-Colonel Foster-Brown was succeeded by Lieutenant-Colonel David Curley on 27 February 2016. The BMA and Bermuda Rifles had re-equipped from the .303 inch No. 4, Mk. 1 rifle to the 7.62mm NATO L1A1 Self-Loading Rifle (SLR) the year before amalgamation. The .303 inch Bren light machine gun and Vickers machine gun were replaced by the 7.62mm NATO General Purpose Machine Gun (GPMG). The Bermuda Regiment inherited the SLR and the GPMG from its predecessors. For Internal Security use, the Federal Riot Gun being used in Northern Ireland for firing baton rounds and gas canisters was also adopted. 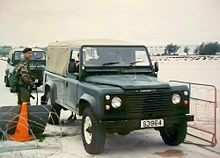 The Bermudian reserve forces had been equipped with standard British Army weapons since their restoration in 1895 (although the Sten sub-machine gun had been replaced in the 1960s with the Israeli Uzi instead of the Sterling). A non-standard rifle was to replace the SLR, however. During the 1950s, the British forces had been pressured into dropping the .280 British sub-calibre round and EM-2 rifle that had been intended to replace respectively .303 inch ammunition and the No. 4 rifle, adopting instead the American 7.62mm ammunition as NATO standard and the SLR, which was a variant of the Belgian FN FAL. Despite forcing the adoption of the 7.62mm round by NATO, the US re-equipped during the Vietnam War with the M16 rifle, chambered for the 5.56×45mm M193 sub-calibre ammunition. Dissatisfaction with the 7.62mm round led NATO to seek a replacement during the 1970s, and the Belgian SS109 variant of the American M193 was adopted as 5.56mm NATO. Although it had also been intended to establish a NATO standard rifle, this did not materialise and different countries developed their own small arms. The Royal Small Arms Factory at Enfield Lock had actually begun work in 1969 on a family of weapons mechanically based on the ArmaLite AR-18, but chambered for a 4.85 × 49mm cartridge and with a bullpup configuration similar to the EM-2. This design was rechambered for the 5.56mm NATO and re-designated the SA80 (Small Arms for the 1980s). The family included two basic weapons: the XL64E5 rifle (also called the Enfield Individual Weapon) and a light support weapon known as the XL65E4 light machine gun (which were to be standardised as the L85A1 rifle and L86A1 Light-Support Weapon). The SA80 would remain stuck in development, however, until 1987, when the L85A1 and L86A1 began replacing respectively the SLR and the GPMG (together with the remaining Brens, which had been retained for jungle use and re-chambered for 7.62mm) in the British armed forces. Re-equipment was slow, and many second-line units were still equipped with the older weapons during the 1990 to 1991 Gulf War. 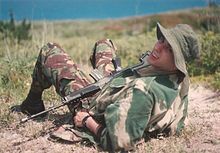 The Bermuda Regiment decided not to wait for the SA80 and replaced the SLR with the American-made Ruger Mini-14 self-loading (in American parlance, "semi automatic") rifle in 1983. The GPMG was retained in the light-, as well as the medium-, machine gun role. The Ruger has a 20-round detachable box magazine and can be fitted with a US M7 bayonet. The original wooden stocks were replaced with Choate black plastic stocks by 1992 and no further modifications have been made since. Small numbers of the SA80 (L85A1 and L85A2) were held from about 1990 specifically for familiarisation training. This was necessary as large numbers of personnel must attend courses (for training, commissioning, or qualification) in Britain, and many serve on active duty attachments (particularly with the Royal Anglian Regiment), and needed to already be knowledgeable of the standard rifle. A replacement for the aging Rugers was sought at the end of the Century, with small numbers of the German Heckler & Koch G36 and the American Colt M4 (a carbine variant of the M16) obtained for trials, following which the G36 had been selected as a replacement for the Ruger and the Uzi sub-machine gun. However, budgetary issues delayed the acquisition of the G36, which also became surrounded by controversy in Germany over reported inaccuracy in warm temperatures. The Ruger was instead replaced by the L85A2 version of the SA80 rifle, with 400 having been delivered in August, 2015. The Ruger was phased out completely by the Recruit Camp of January, 2016. Many of the pictures displayed are dated, and at the very least over 12 years old. A Permanent Staff Instructor (PSI) with senior Non-Commissioned Officers of the Bermuda Regiment. The main gate of Warwick Camp, as it appears today, from the South Shore Road (formerly The Military Road). Bermuda Regiment Corporal's Mess at Warwick Camp. Bermuda Regiment soldiers play football on the parade ground of Warwick Camp. 25 Pounder (88mm) field gun of the Bermuda Regiment's ceremonial Gun Troop. A motorboat of the Bermuda Regiment Boat Troop moves out of the Great Sound, past the HMD, Bermuda, on Ireland Island. An NCO of The Lincoln and Welland Regiment attached to a rifle company of the affiliated Bermuda Regiment training in Jamaica, 1996. Jamaican Defence Force soldier with a sergeant of the Bermuda Regiment in the Blue Mountains of Jamaica. An NCO of the Bermuda Regiment armed with a General Purpose Machine Gun, aboard a Rigid Raider. A Bermuda Regiment NCO in No. 5 (Desert Combat) Dress, armed with a Galil AR self-loading rifle at USMC Camp Lejeune, in 1994. Former Second-in-Command (2-i-C) of the Bermuda Regiment, St. George's town crier, Major Donald Henry "Bob" Burns, MC, gained the Guinness World Record for the loudest human speaking voice of 113 decibels. ^ "Territorial Army - definition of Territorial Army in English from the Oxford dictionary". Retrieved 8 May 2016. ^ "Royal Navy, including HMS Affray, 1951-1960". naval-history.net. Retrieved 8 September 2015. ^ "Amalgamation". Bermuda Regiment. Retrieved 9 August 2014. ^ The Quarterly Army List, DECEMBER, 1946. Corrected generally to 8 October 1946. Volume 1. Page 14. ORDER OF PRECEDENCE OF REGIMENTS, ETC., IN THE ARMY. His Majesty's Stationery Office, London. ^ "Regiment gets 'Royal' name change as gift - The Royal Gazette:Bermuda News". The Royal Gazette. Retrieved 8 September 2015. ^ "BERMUDA". stablebelts.co.uk. Retrieved 8 September 2015. ^ "House of Commons - Foreign Affairs - Written Evidence". parliament.uk. Retrieved 8 September 2015. ^ "Foreign Affairs Committee: Press Notice". UK Parliament. Retrieved 8 September 2015. ^ "Bermuda Regiment 50th Anniversary: The Bermuda Regiment SYNOPSIS"
^ "3 Are Indicted in Plot to Smuggle Chinese Aliens Into New York". The New York Times. 10 October 1996. Retrieved 8 May 2016. ^ Special Operations.com The Camp Lejeune MOUT Facility. Familiarization Images. ^ Halifax Media Group, Jacksonville Caily News: Bermuda Regiment trains in casualty care at Camp Johnson. By THOMAS BRENNAN - Daily News Staff. Published: Tuesday, 7 May 2013 at 16:27 PM. ^ "Engineers: different uniforms, identical mission". 2nd Marine Logistics Group. 13 May 2013. Retrieved 8 September 2015. ^ Administrator. "Royal Bermuda Regiment". bermudaregiment.bm. Retrieved 8 September 2015. ^ "bermudanetworknews.com". Retrieved 8 May 2016. ^ B.M.A. Begin 2-Week Camp At Warwick. The Bermuda Recorder, 22 January 1964. Page 1. ^ B.M.A. Begin 2-Week Camp At Warwick. The Bermuda Recorder, 22 January 1964. Page 1. Rifles go to Camp At Week's End. The Bermuda Recorder, 5 February 1964. Page 1. ^ "Bermuda Regiment Equipment: Uzi Sub-machine gun". Retrieved 8 May 2016. ^ "The EM-2 (Rifle No. 9, Mk 1):". Retrieved 8 May 2016. ^ Ezell, Edward Clinton (1984). The Great Rifle Controversy: Search for the Ultimate Infantry Weapon from World War II Through Vietnam and Beyond. Harrisburg, Pennsylvania: Halsted Press. ISBN 978-0-8117-0709-1. ^ Hughes, David R. (1990). The History and Development of the M16 Rifle and its Cartridge. Oceanside, California: Armory Publications. ISBN 0-9626096-0-9. ^ "Ruger Mini-14". Archived from the original on 26 February 2014. Retrieved 9 August 2014. Wikimedia Commons has media related to Bermuda Regiment. The Camp Lejeune Globe: Bermuda Regiment soldiers conduct training aboard MCB Camp Lejeune. St. Augustine Record: Bermuda Regiment will train at Camp Blanding. 1 May 2002. Official list of Royal Artillery Association branches. POTSI (archives): THE GREAT WAR - BERMUDIANS IN IMPERIAL(LESS LOCAL) UNITS, AND IN ALLIED FORCES. The Royal Gazette: "The closest thing to a plantation in Bermuda is Warwick Camp"
Law Info: "Bermudian premier criticizes youths seeking to end draft "